Take a look at this homemade sand playdough on Frugal Coupon Living. We paired this kids craft with a fun pirate vignette for all the more fun. Aaarrgghh! Aaaarrrrgggghhhh! 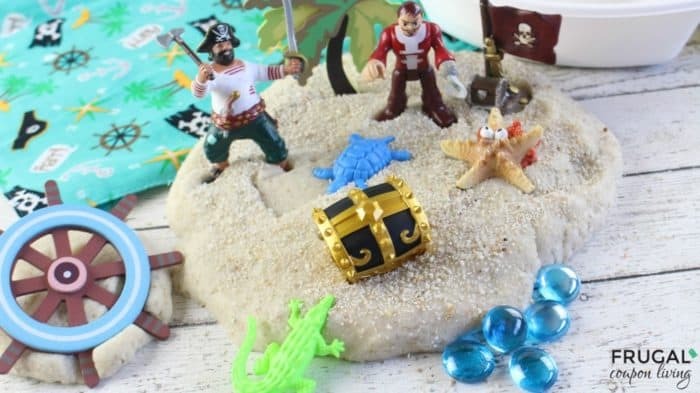 It’s talk like a pirate day every day when you have this Homemade Sand Playdough. We had fun with this creative, crafty vignette. 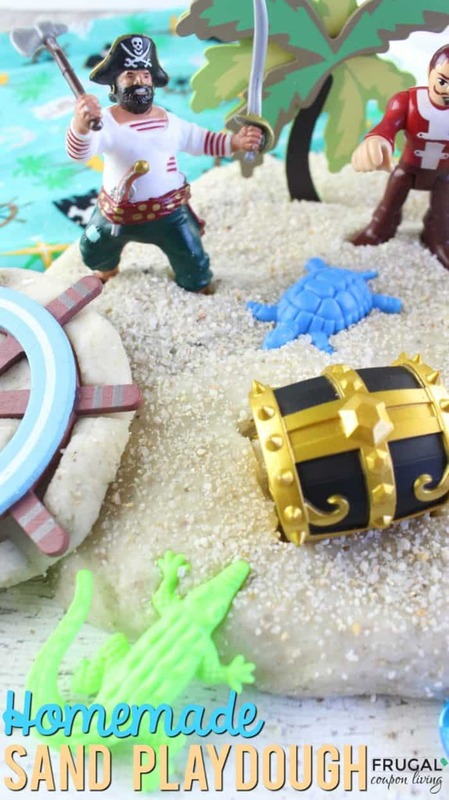 Create a fun pirate scene for hosting a party or just for an afternoon of play at home. This DIY project is much easier than you think using your every day pantry ingredients including water, vegetable oil, flour, salt and cream of tartar. We added some fun elements like decorative sand, gems (our loot), and pirate figures. Of course you could personalize this to any scene creating an under water adventure with mermaids, fish, and coral. We think this could be a fun scene for finding nemo. My girls wanted to use the leftover sand playdough for Barbie. Create a fun shoreline for Barbie to sit down and relax on her next beach getaway. If creating sensory play for for preschoolers, get some small dump trucks and go over giant mounds of sand! Whatever your style, you choose the scene, you choose the fun! 1. Add the water and oil to a large sauce pan and stir to combine. Add the flour, salt and cream of tartar and whisk until all of the ingredients are wet and the flour lumps have disappeared. Keep stirring over medium heat until a stiff ball of dough forms and you can no longer stir the dough easily (3-4 minutes). It will look like a ball of pizza dough. Immediately remove from the heat and place the warm playdough on a level workspace. Knead for 1-2 minutes or until soft and smooth. Flatten the kneaded playdough out on your workspace and sprinkle 1/4 cup of the craft sand on top. Knead the sand into the playdough and add another 1/4 cup of sand. Continue to work the sand into your playdough with your hands until its well mixed. Sprinkle the remaining sand on top and add a few aquamarine gems for water. This homemade sand playdough will give your kids hours of sensory and role playing fun! Add pirate figurines, trees, treasure chest, crocodile, etc…any kind of fun pirate accessories you may have. This is a great sensory activity! You can keep in an airtight plastic bag or container for up to three months. We think Tupperware works great! Also take a look this fun up-cycled craft. 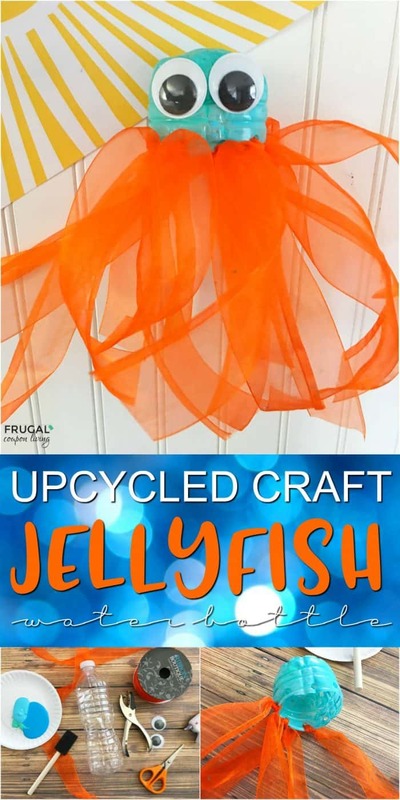 A Upcycled Jelly Fish made from a recycled water bottle. Pin to Pinterest. Shark Week Ideas are also fun – foods, crafts, and activities! Pin to Pinterest.